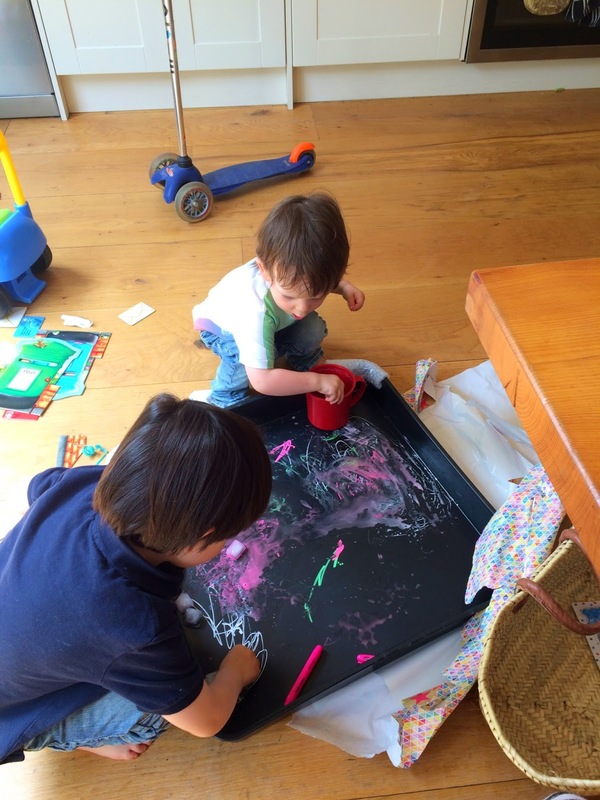 Claire at Play Hooray is a friend in need to tens of thousands of mums on Instagram - providing much needed inspiration and encouragement to keep the TV off and find a creative way to play with children aged 0 to 8 years old. What she does, and especially her Play Prompts, have been massively helpful to me so I wanted to share my experience. With a pack of her play ideas in my nappy bag or a print offs stuck on the fridge, I'm never at a loss for something to do on a rainy day. Like a lot of other people I first discovered the lovely Claire via Giovanna Fletcher's Instagram feed. Some may think that being a mother of three means I know what I'm doing with children and in some ways I do but my god entertaining even one of them is so difficult sometimes, two even harder, two whilst pregnant and trying to have some semblance of a normal life was just incredibly frustrating and almost impossible. Now I have three at quite different ages 5, 2.5 and 8 months and so quite often I feel like I'm aiming at three different levels. Which is where Play Hooray comes in and frankly, saves the day (whilst making you a little bit angry that you didn't come up with it first). Claire is an Early Years Teacher which in terms of nursery and pre-schools in the UK is the be-all and end-all. As a mother of one she decided to create some prompt cards for those days when you are stuck in the house with no idea how to entertain your child without switching on TV. She decided to get some cards printed to see if they sold, they did and she now has a full range of different prompts and products available some of which I've bought and have been using. 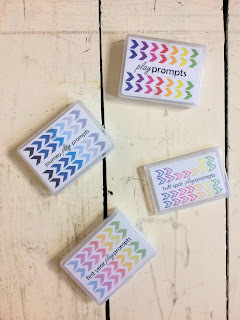 My first purchase was the £1 printable Easter Play Prompts printable which I stuck to our fridge in case we needed them. The boys saw this incredible organisation on my part and decided to get a horrendous virus which meant they were in bed for the whole time and we didn't really do anything Easter-y at all. But I liked what I saw. Even just having them there made me feel I had options. Options that we would all enjoy and they would actually benefit from. And the thing is Claire has not created these for you to spend hours playing with your kids. They are to encourage independent play with support from you so you can do your emails and have a cup of tea and just be present while they get on with the activity. 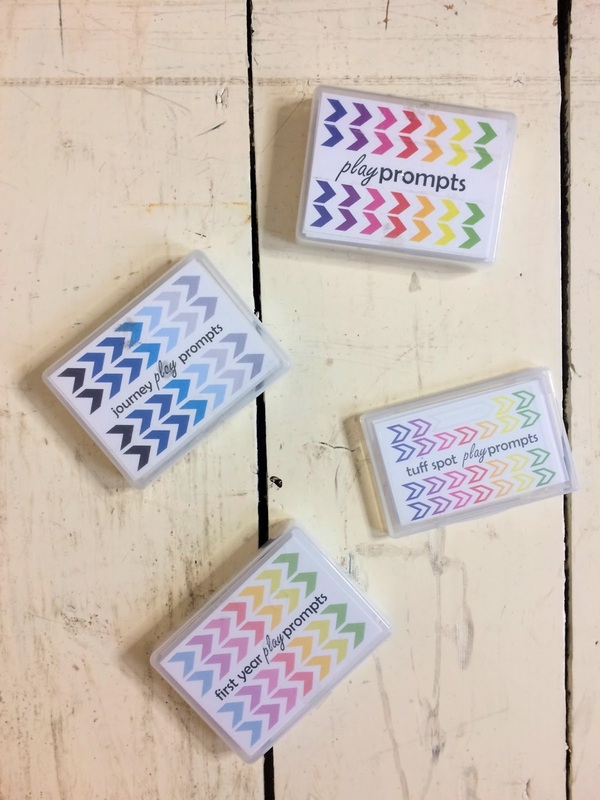 Then whilst planning what to take to entertain the boys on the epic train journey from London to Avignon (7ish hours) I saw her Journey Play Prompts and bought those. They take up so little space in the bag and, though we didn't have to use them because for some reason the boys decided to be incredibly well behaved, it was great to know they were there. They would have worked as well had there been bad weather on holiday most of the prompts could work when you are in a holiday rental with only a few toys. I love having these in the change bag now for if we need them when we are out and about. Then for Jim's birthday I was wondering what to suggest for my mum to get him. We got him a scooter and helmet and, as always, I'm trying not to get him more plastic toys (Ned got him the most annoying fire engine toy imaginable) so we got a tuff spot (which Claire used to stock but now has ones she recommends in her Amazon affiliate list) and a pack of the original Play Prompts. My mum was really dubious but I thought in the autumn when Ned is at school and I have a small baby to deal with it would be great to have play ideas and somewhere that he can make a mess inside if the weather is awful. I also got him so cheap chalk pens from WHSmith. 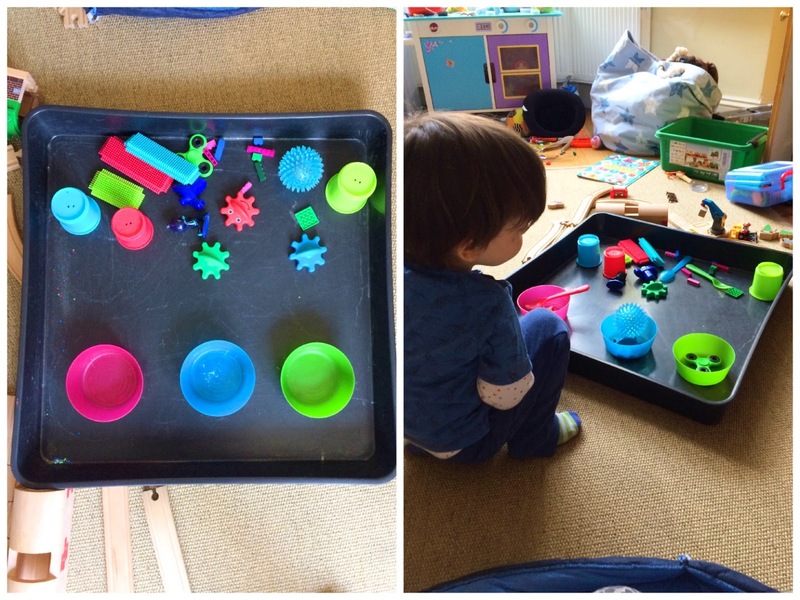 Both boys absolutely loved the play tray and spent the whole weekend playing with it. You can see in the picture below they were playing with it before they even fully took it out of the paper. They used the chalk pens, filled it with water and glitter and petals, we cut up straws and they used diggers and cups to move the straw pieces around. I got to sit and have a cup of tea with my feet up while they did it - we were all so amazed. Then Jack arrived, and was eventually in need of actual non-milk related entertainment and for his Christmas stocking I ordered some of the First Year Play Prompts. (Yes before you ask he does need a stocking firstly because he has older siblings and secondly because I love Christmas.) I seem to have followed the typical parenting pattern with Ned having a lot of attention, poor Jim being left to get on with things and now Jack is reaping the benefit of the guilt that neglect induced. We go to Monkey Music and I try to come up with creative ways for him to play when we are at home alone during the three days that Jim is at nursery. However, I'm also thinking up things for Jim because I'm not a total monster and he only goes to nursery three days a week - I try to work as much as I can on those three days leaving Monday and Friday for playing (and the never ending washing mountain). As soon as the Tuff Spot Mini Pack was available I bought it to add to my collection. A mini pack has 25 ideas and the standard packs have about 100 ideas - both come in plastic boxes so they are really easy to store. I've found prompts in each set that has given me some great ideas for when Ned has a friend over after school. Setting something up before you go and get them means you have a lot less house destruction in that dangerous time between pick-up and supper. And if we go to people's houses I always take a pack with me, especially if those people have older, or no children. Even if you come across something you already do I often find it will trigger me to do it slightly differently and what makes these so perfect is that you know there is a qualified Early Years Foundation trained person behind them. These aren't just play ideas, they are created to help your child develop whether it's their concentration, motor skills, speech or understanding. It's a danger for me to go on her website as I just want all the packs. Some of my favourite prompts are: freezing plastic animals in containers for little hands to melt and rescue (Play Prompts) this one is great in the summer outside in the tuff spot; Would you rather be a fish or a bird question from the Journey Play Promps; Build a rainbow with items from around the house (Play Prompts); poke straws through the holes in a colander for your baby to pull out (First Year Play Prompts) and use masking tape or washi tape on the tuff spot to create roads (Tuff Spot Mini pack). I hear so much about children needing extra tutoring when they are school now so I want to give the boys as good a start as I can at home and I know that learning through play is ideal - especially if you have boys who often develop a bit slower then girls. I also find that if I set something up for one child it will also work in a different way for one or the others. Jim loved looking at what was on Jack's high chair ribbons and helping him pull them up. It was a way of them playing together before they are actually of an age to be able to play together. 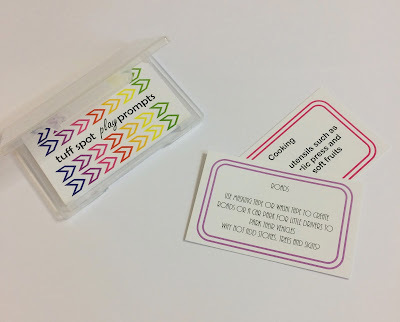 These make wonderful and unusual gifts - if you are going to a baby shower take a pack of the First Year Play Prompts. 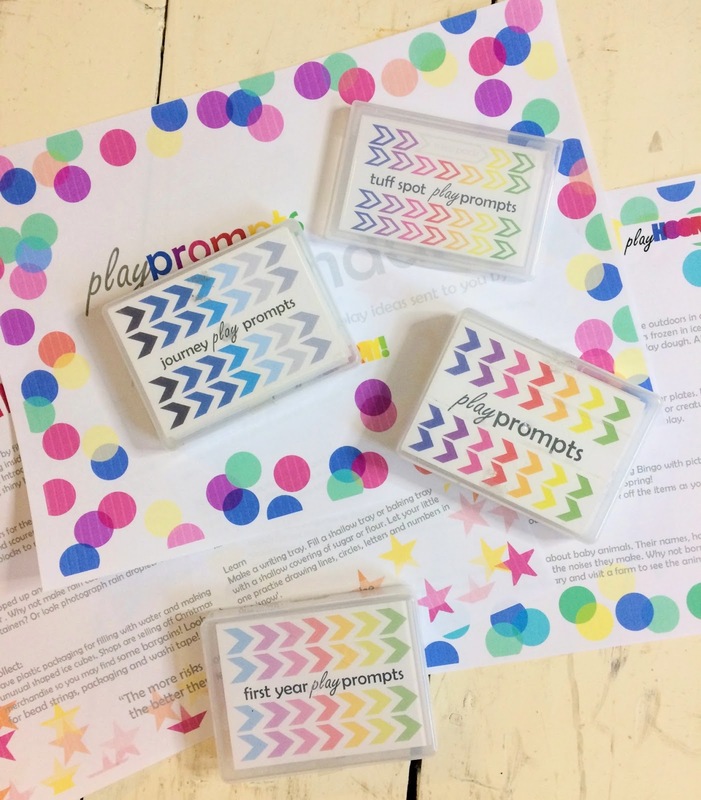 If you are going to spend Christmas, Easter or just a weekend with young children then a pack of any of the Play Prompts are lovely to take along. She does lots of other lovely products too - A Year of Play is another great one for a baby shower. Something for a godchild? One of the PlayPacks would be lovely and there's a great Number Grids Play Pack which would be lovely for a child about to start school. Next on my list is the Outdoor Play Prompts for all three, Talk Mini Pack for Jim and the Water and Music Mini Packs for Jack when he's a bit bigger and I think Ned would love to be able to get involved in choosing with the A-Z Play Prompts. See, I told you I was addicted. These packs would be great to inspire you if you've decided to start childminding which I know a lot of mums do before their kids go to school. But what I love most about Play Hooray is Claire. Her enthusiasm is infectious. If you are on Instagram, follow her. She has so many clever ways not only to play with your child but to talk to them, help their concentration and prepare them for pre-school and school. At the time of writing she does a 10am Instagram live everyday when she shows you an activity and in a world where parenting is always judged it feels like a really friendly, positive place to be. Sign up to her mailing list and every month you get new play ideas which you can print out to make a calendar which are just fantastic. Sign up but putting your email in the pop-up on the home page. She has also really inspired me to be more clever when I'm out shopping - I now always nip into Poundland when I go past to see what they have that we can use at home. I recently picked up some things for Easter that we can use to decorate and as part of activities. After Easter I'll put these way with the Easter decorations and reuse them next year rather than chucking them out as I would normally do. But she's the first person to say don't go out and buy stuff, use what you have around the house which is what I did when I set up the sorting activity for Jim below. I literally went through the toy bag and pulled out some colours that matched their cereal bowls. And I've become more thoughtful about what I throw out. I've been keeping all the plastic scoops from Jack's formula which I usually hate throwing out because it's such a waste of plastic. They are great for using in the tuff spot to scoop, water play or in the garden. In short, if you or someone you know has kids and you haven't checked out Play Hooray, I cannot recommend it highly enough. Of course, in a perfect world we'd dream up our own exciting, colourful ideas for entertaining children - but discovering Play Hooray will give you a well of ready ideas - and some friendly encouragement from Claire. It's actually way more fun playing with your kid if you've done a little prep... which may sound obvious to some of you, but it's a truth that can be hard to live up to. Thanks Claire for making it easy. I'm a make-up artist, beauty blogger and writer but my other passion is food and cooking. I have worked as a Managing Editor in Publishing for six years and before that did a three month intensive course at Tante Marie school of Cookery. I do get sent some things to test and review and these will be tagged PR Sample for clarity. I live in West London with my husband Joe our three sons Ned, Jim and Jack and our dogs Mouse and Loki. Words and photos All content © 2010-2015 Corinna Harrod. Bunting Design by Jo Walker. Powered by Blogger. The Kitchen God’s Wife - Amy Tan - I love Amy Tan's writing. I find it completely transports me and so it seemed the perfect way to get through the very long end of January. A mother tells her daughter the story of her life in China before she moved to America and all the secrets that she's kept hidden for years. © Blue Sky and Bunting. All rights reserved.